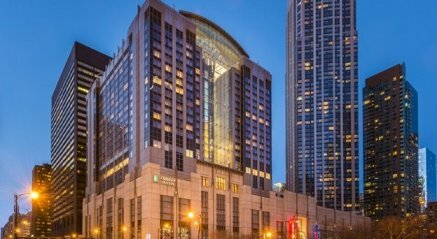 The Embassy Suites Chicago Downtown Magnificent Mile is a great place to stay during your trip to Chicago. With reasonable rates and an incredible location in the River East Arts Complex, business opportunities and attractions are just minutes away. Located just five minutes from Navy Pier, Embassy Suites Chicago Downtown is so close to a day of fun for everyone. Home of many restaurants, visitors can enjoy a diverse dining experience between rides on the Ferris wheel or browsing stores. . The II-VI Workshop committee appreciates all attendees to reserve their hotel needs at the official workshop hotel, the Embassy Suites Chicago Downtown Magnificent Mile. By staying at this hotel you will assist the workshop lowering our costs of producing the workshop and continuing with the program in subsequent years. The Committee has had to guarantee a certain amount of room nights in order to achieve our contract with the hotel. Any rooms that fall below the contracted amount, the workshop becomes responsible for and has to pay an attrition fee. We truly appreciate your cooperation in this very important matter. The 2017 best paper award winner is Taylor Hubbard from Boston University. The presentation title, "Numerical Modeling of Three-Dimensional Microlenses for IR Focal-Plane Arrays"
This year's Keynote Speaker will be Dr. Philip Perconti, DIrector of Army Research Laboratory. This year the II-VI Workshop will feature a tutorial section on Monday, November 18. The tutorial will be given by Dr. William Radford and Dr. Chad Fulk of Raytheon Visions Systems. The tutorial welcomes all interested and registered U.S. II-VI workshop participants. The workshop committee particularly encourages graduate students, post-docs and junior researchers to attend the tutorial and explore the topics in detail and tap into the experience of and network with the well-established researchers. More information about the tutorials such as topic, registration, time and location will be posted online and also distributed via email.